In some tutorials on our support site you may be instructed to add CSS code to your theme. Or, our support team may have sent you a custom CSS code snippet. Below, we'll teach you how and where to place custom CSS code. It's super easy! Go to your WordPress dashboard > Appearance > Customize. Once inside the Customizer panel, click on the "Additional CSS" tab at the bottom left. 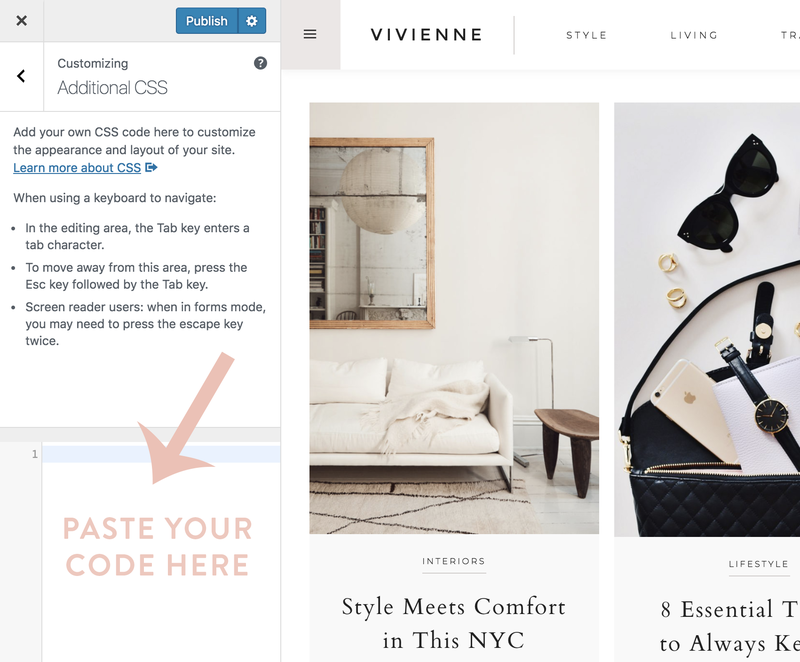 Paste your CSS code snippet in the Additional CSS box. Click Publish. Don't see the change on your site? If you've added your custom CSS code and the desired change isn't taking effect on your site, you'll need to clear your caches. Start by clearing your browser cache, then clearing any plugin or server caches. If ALL of your caches are cleared and the change is still not appearing on your site, you can install Busted as a last resort to force the file to update.